Presentations from this year's Conference are now available. Click here to view them. Please note: Not all sessions had presentations, all of the ones we have received are available online. All sessions are FREE to attend and delegates can choose sessions according to their interests. With a blend of captive case studies, panel discussions and round table sessions the Captive Live UK agenda is packed with unmissable industry insights and updates. 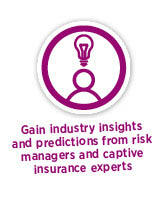 Captive Live UK is open to all captive insurance professionals. Some sessions however are only open to Captive Review members and a select group of Risk Managers and Captive Owners. If you would like to find out about becoming a Captive Review member and taking advantage of an early bird membership offer please click here. Online registration is now closed but if you would like to attend please email Jessica Jones at j.jones@captivereview.com. You can also register when you arrive but please ensure that you leave enough time to do so.